Burger Records' annual music fest, Burgerama, is really stepping up its game in its fourth year. Expect two days of pretty incredible music, from headliners Weezer, Ty Segall and Fidlar to classic psych rock god Roky Erickson. 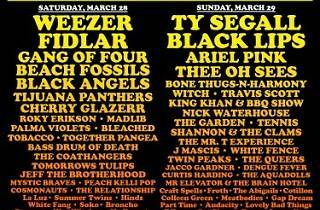 Other notable acts include Ariel Pink, Dengue Fever, metalheads Witch and, incredibly, Bone Thugs-N-Harmony. Burgerama has gone south to the Observatory in Orange County this year, but everything else about this fest is on the up-and-up.